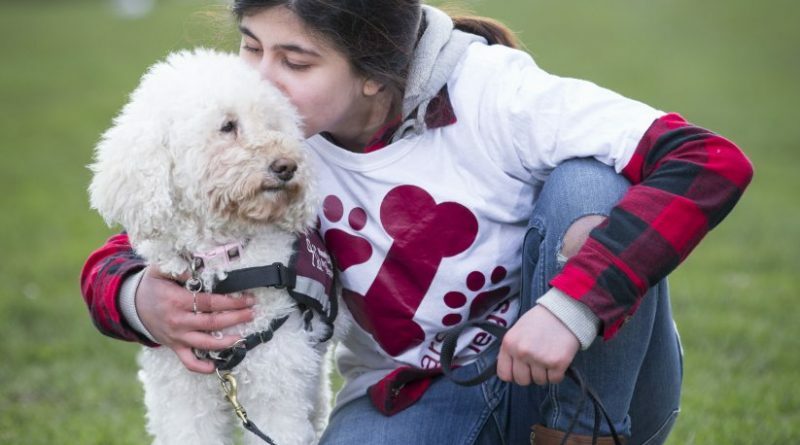 Waffle is a hearing dog who has become the ‘ears’ for his young owner, Sarah Mohammadi, and helped her reconnect with everything around her. Chosen from the Child’s Hero category are Sarah and Waffle. Waffle is Sarah’s hearing dog. Sarah is 14 years old and profoundly deaf. She was matched with Waffle by Hearing Dogs for Deaf People one week before Christmas in 2012. Waffle is now five, and since they were matched the change Waffle has brought to Sarah’s life is enormous. Waffle is Sarah’s best friend and always there for her. Sarah says Waffle is her ears. Waffle wakes Sarah up with the alarm clock every morning as Sarah can’t hear it. For a child that could never sleep in her bedroom as she felt so alone, she can now do this, knowing Waffle is there. Sarah is more confident and can get out more knowing Waffle is with her, and where Sarah would not and could not make conversation to strangers before or even achieve eye contact, because of Waffle she now can. Waffle is Sarah’s hero, a complete life changer. You can vote for Sarah and Waffle here.